Modern thinking treats the institution of marriage as a contract between man and woman. The breach of trust between husband and wife constituting adultery has been a matter of heated discussion in our country over the last few weeks. While we do not intend to enter into a discussion on the merits or otherwise of this particular controversy, we do believe that a review of the spirit of Daampatya (the ‘institution of marriage’ or ‘wedlock’) in Bharateeya civilization and culture will be in order at this time. In our culture, the institution of marriage is not a contract, but a bond that follows in the footsteps of nature. 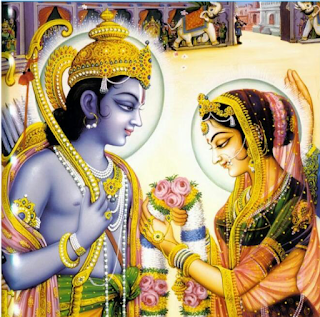 The mantras uttered during the Vivaaha (marriage) proclaim the bond between husband and wife to be akin to that between heaven and earth or thought and word. The dark clouds of the yonder heavens pour copiously onto earth to nourish the germinating seed. The light and heat of the heavenly sun sustains the life on this earth. For whose benefit, heaven or earth? Actually neither. They are both upholders of the sacred order of nature, ensuring that the cycles of rain and shine go on uninterrupted. They are selfless forces that ensure that flora and fauna, nay all life on earth perpetuate themselves, grow and glow in consonance with the scheme of mother Nature. Speech expresses the nature of thought. The rise of thought and the consequent speech are but instruments for the well-being of the individual. In like manner, Vivaaha or Daampatya are not just a license for gratification of the senses. 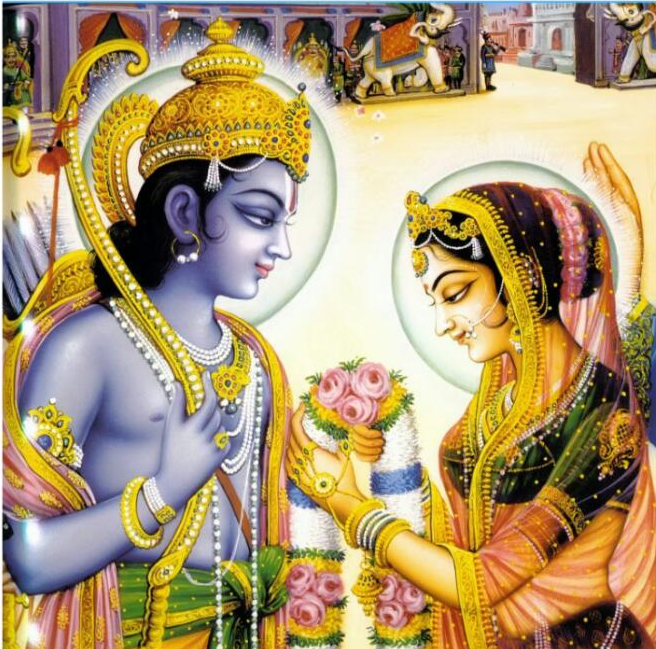 It is a solemn responsibility to implement the bidding of the divine couple – Lakshmi Narayana or Parvati Parameshwara who are verily the fount of the forces of Nature. The Bharateeyas thought of Daampatya as a Yagnya to bring forth progeny endowed with Atmagunas who would in turn continue the virtuous cycle. One may despair ‘Oh! These Indians have turned the romantic relationship of marriage into a dry ritual of perpetuation’. But not so! The very Vivaaha mantras that talk the simile of heaven-earth also sings ever so gently, the sweet and loaded conversation between husband and wife ‘May your heart be mine … let my heart be thine’. Ruru who gave up half his lifespan in order to bring back his betrothen Pramadvara back to life was a son of a Rishi too. The self-realized Kardama-prajapati, it is said, spent several years in enjoyment in scenic mountain slopes and verdant forests with his consort Devahuti before the master yogi Kapila was born to them. Vasishta-Arundhati, Atri-Anasuya, Kashyapa-Aditi and countless other enlightened Rishis were householders and brought forth scores of children rivalling themselves in askesis. Thus the Rishis of Bhaarata were just as well, masters of Bhoga-sense enjoyment as they were of restraint and Yoga. Now, since the bonds of Daampatya are a Yagnya in service of Mother Nature and the forces thereof, its breach too is to be resolved in the court of Nature-Srishti and the SrishtiKarta. The Kannada term for punishment is ‘Shikshe’ which is interestingly synonymous with education. (The corresponding term in Samskrita and many other Indic languages is Danda which is synonymous with restraint, backbone – that houses the inner workings of Yoga, a king’s scepter or a staff used by hermits as a symbol of the yogic brahmadanda). That this is so, is no coincidence; rather that was the intent. Unlike the word ‘punish’ which has overtones of inflicting injury and retribution, the Bharateeya words have strong overtones of education, restraint, penance and control of the mind, because that indeed was their concept of punishment; re-education, corrective action by restraint of the mind and penance. That is why Ahalya’s punishment was penance and askesis while remaining unseen by the world. The prescription for her transgression was an apparent bane that would in time to come bestow a boon – the darshana of Sri Rama; loss of sensual attachments; restoration of her purity and reunion with Gautama. It is also to be noted here that Indra who was an equal partner in the transgress, is rendered impotent. While the prescription was different for each offender, the outcome intended was the same – resumption of control over senses. There is no mention here of the courts or jails; and not even a hint of marriage registrations or divorce. In Bharateeya culture the bonds of Daampatya are strong and inviolable. They are also equally deep and subtle. It is said that Padmavathi, the consort of Devout poet Jayadeva swooned and passed away when she heard the false news of the death of her husband. She was subsequently brought back to life with the mellifluous notes of Jayadeva’s songs in praise of the Lord. What do we call such exalted souls? Romantic couple or devotees of the highest order? That they could as a civilization achieve at once, sense gratification (that calls for indulging the senses) and penance of the highest order (by denying the senses) will count as one of the most astonishing and unparalleled achievements of the Bharateeyas. Pitru paksha - yenu? yeke? Hege?